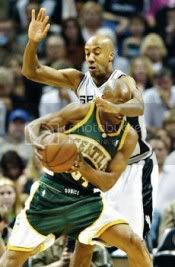 This is what you get when you cut Bruce Bowen from your tourney roster. Fed up with its recent failures, the United States assembled a new program with new plan. The end result was all too familiar. Greece used a sizzling stretch of shooting across the middle two quarters to turn a 12-point deficit into a 14-point lead, and beat the Americans 101-95 Friday in the semifinals of the world championships. Greece (8-0) can earn a world title to go with the European championship it won in 2005 with a victory Spain in Sunday’s gold medal game. Spain (8-0) beat Argentina 75-74 on Friday night. Greece? Greece? What an embarassment.